Dies to Die for !! why not go check them out - they are amazing! 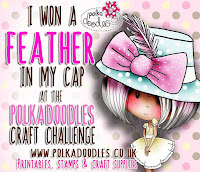 Our winner of the challenge will receive a $10 gift voucher to the Polkadoodles Download Store. You have until Noon, GMT, Friday 7th October to enter. 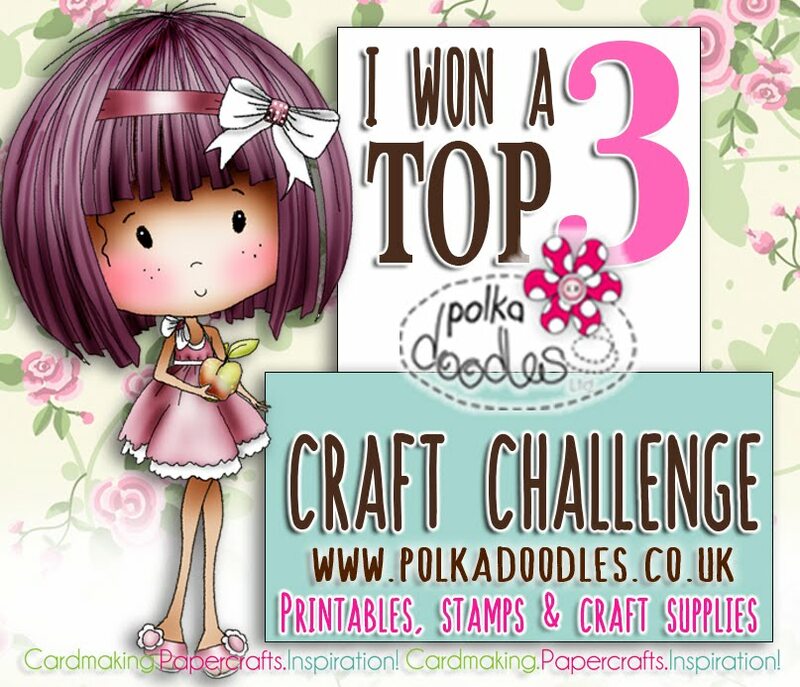 However, we do love seeing your fabulous makes with Polkadoodles images. Now onto the fabulous inspiration from the Design Team. Helen - It will soon be here only a few more weeks to go, Yeah!!! 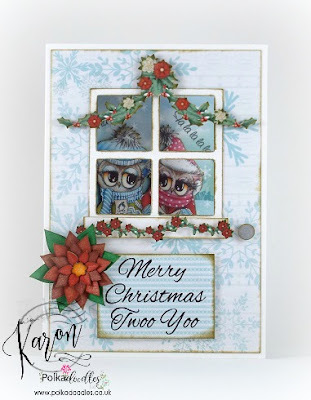 I love Christmas and so do Twiggy and Toots, so I've used their Festive Fun collection for my little bit of inspiration. 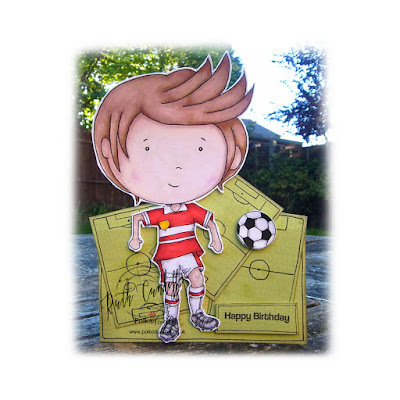 There's even loads of fab templates you can use. I used a scene and embellies from the CD and one of the fab images and coloured it with copics. Merry Christmas PF fans!! 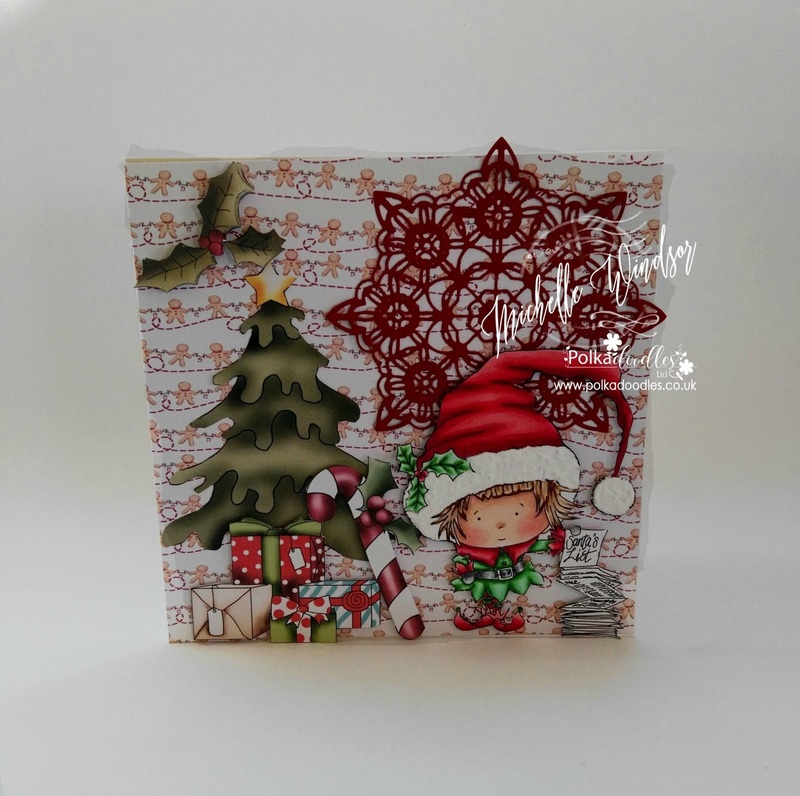 Pauline - I have made a wall hanging using the fabulous new Festive Christmas Collection, the adorable Robin and beautiful Poinsettias are from the CD, I have printed them out and fussy cut them - I love fussy cutting, I find it so relaxing. The sentiment is also from the CD, I printed it onto one of the backing papers. 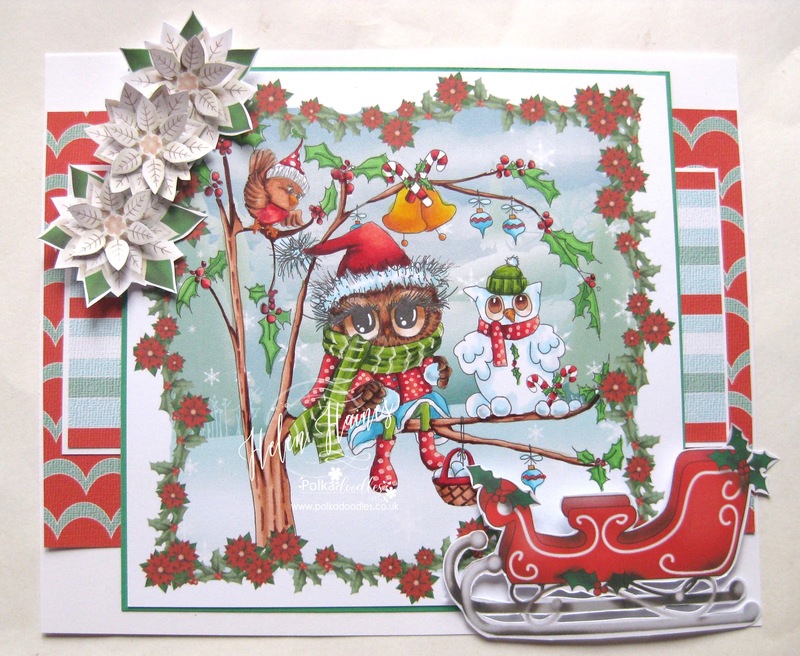 Lisa - I like to make a variety of Christmas cards, some more complex and some simple easy to produce designs. For these cards I have used the Twiggy & Toots Festive Fun Download Collection. I faded the bauble digis to pale grey and placed them behind the sentiment, before printing onto white linen card. Carol - I've had a lot of fun with the new Festive Christmas Collection and added some papers and the most gorgeous Angel Owl from the Twiggy & Toots Festive Fun Collection. 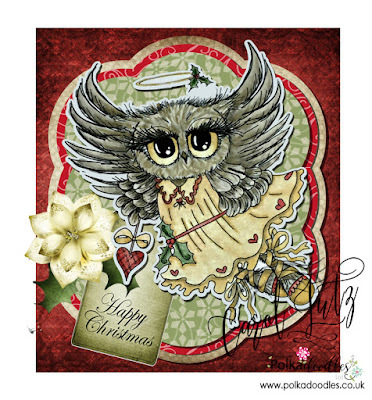 I printed Angel Owl and coloured her with my copics, fussy cut her out and then added her to the card layered up with papers, a tag, a flower and some holly leaves. So much festive fun. 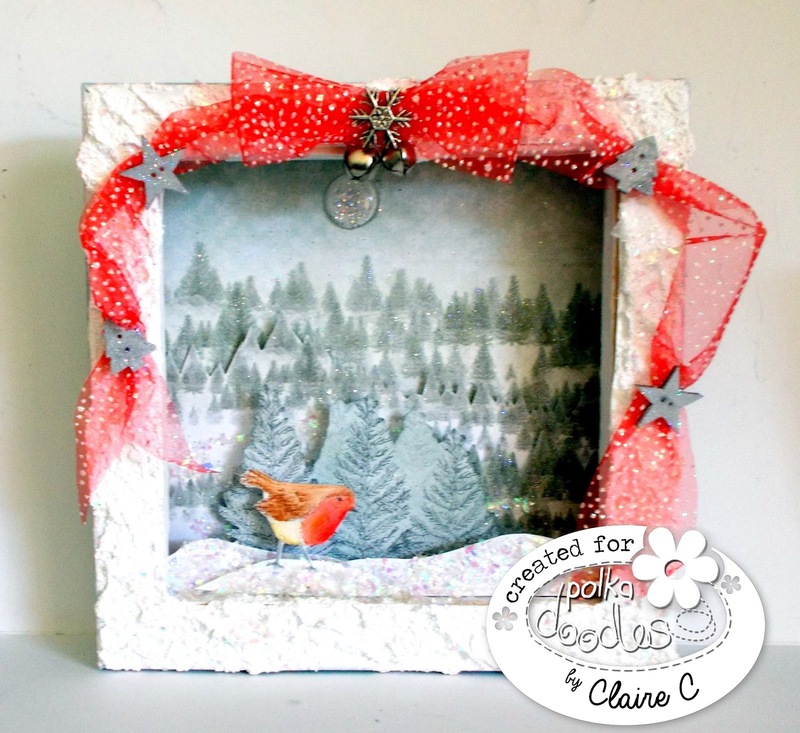 Elena - I used the Husky Hugs of Octavia collection Frosted Winter, the scenery is made with Picknix Collection 2 - Gingerbread Twist. 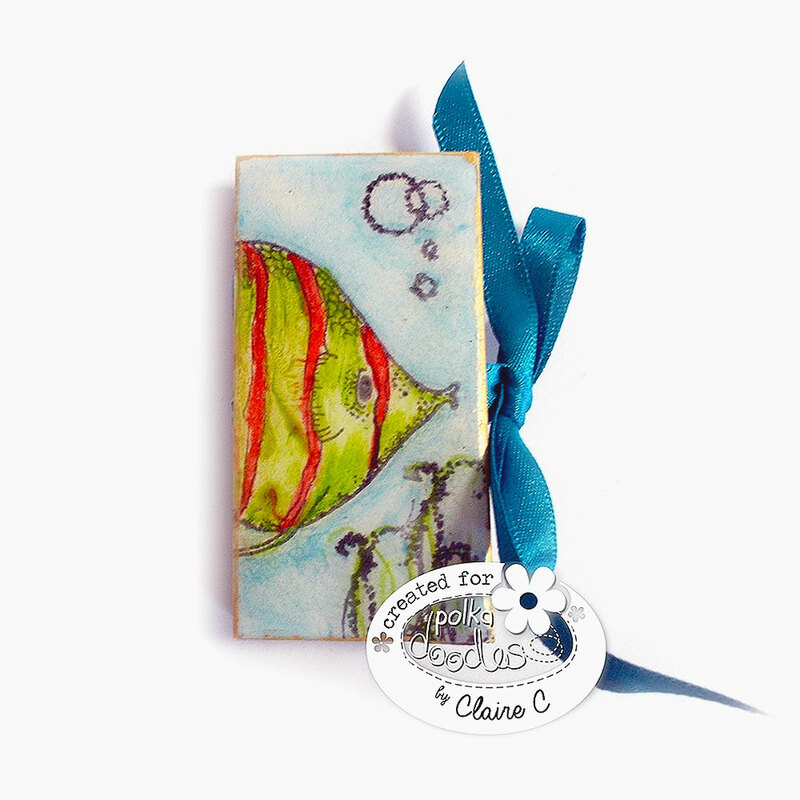 Ruth: I've made some really quick and simple pillow boxes for gift cards for my three nieces this Christmas - I've used Twiggy and Toots Festive Fun and added one of the little characters as a gift tag. Such fabulous creations and inspiration. which you check all about on the pages tabs above. 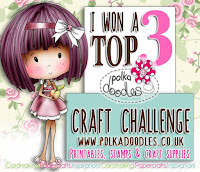 entries that have used a Polkadoodles image. This has now come to the end of the season and we have our overall winner. Well done Nick - you have one 3 Digis from the Polkadoodles Download store. Please email us HERE quoting FFWPD001 to claim your prize. Congratulations to everyone. We thank you all for taking part in our challenges. We love coming o visit and seeing all your wonderful creations. Starting a New Challenge this week. 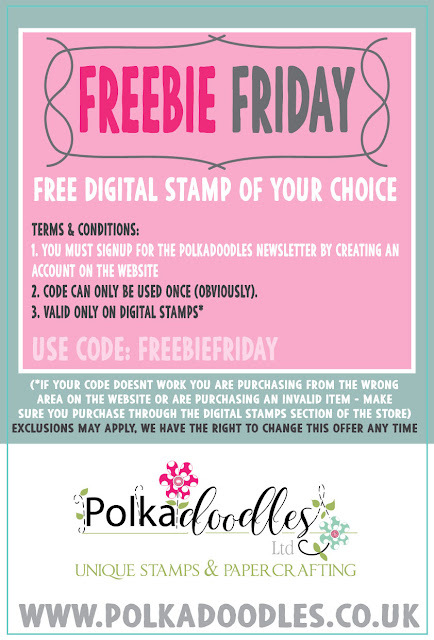 Winner will receive a $10 voucher to the Polkadoodles Digi Store. 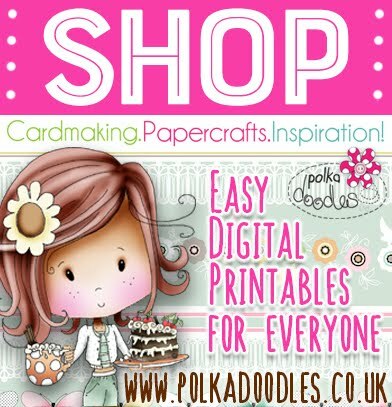 However, we do love seeing your fabulous creations with Polkadoodles images. Now let's see what wonderful inspiration the Design Team have for you this week. 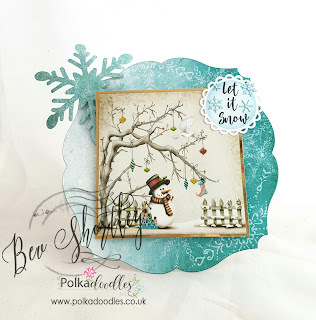 Lou: I have used the new Festive Christmas stamps to create my project - Christmas lights. I have stamped the different sized poinsettia petalplaced a light in the flower centre. Tracy - I used Design Sheet 2 from Work & Play - Festive Hollybobs. Lots of fussy cutting and inking. Relaxing to put all together and easy to make. 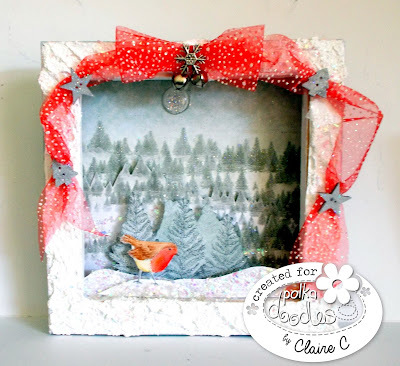 Anjie - I used the Octavia Frosted Winter collection to create this Christmas decoration. Lots more details and photos on my blog. 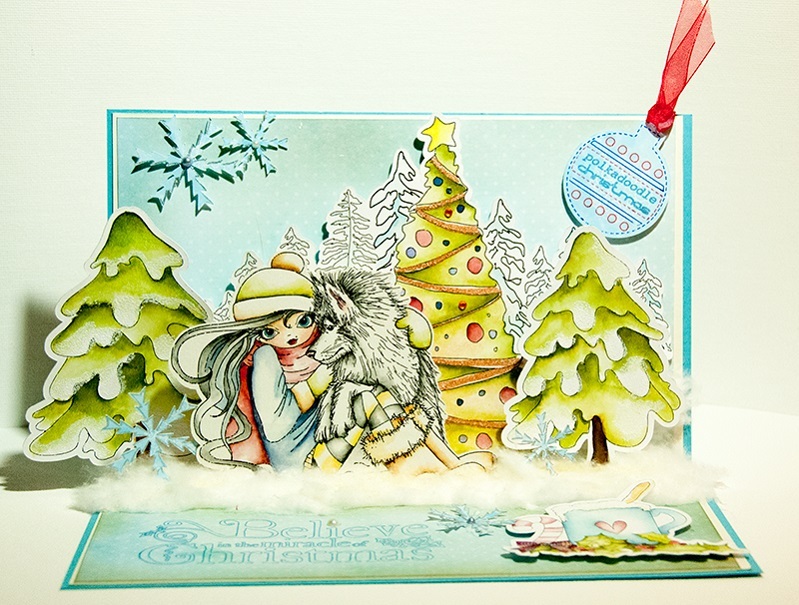 Katrina - I have used the gorgeous new Christmas Soup collection for my card. I built up the flowers by stamping one petal at a time and painting in with masking fluid as I went. The sentiment and backing paper were arranged in CraftArtist before printing over the top of the masked flowers. I watercoloured the flowers using Spectrum Aqua pens, added a bit of glitter and glued polystyrene balls in the centres. Bev here with a quick card made using the fabulous new Festive Christmas CD which you hopefully ordered from Nikky's show on Create and Craft recently? If not it's available to pre order HERE. 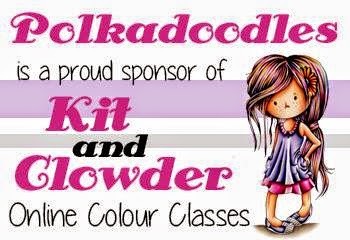 I opted from pre coloured images but made sure I added loads of sparkle!! Lots of fabulous creations to inspire you. 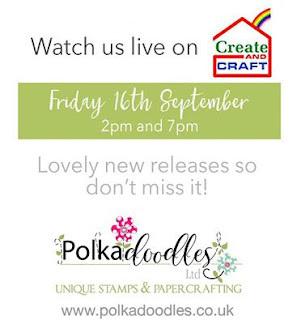 Don't miss our lovely Nikky on Create & Craft today with our brand new latest collections! You have until Noon, GMT, Friday 23rd September to enter. 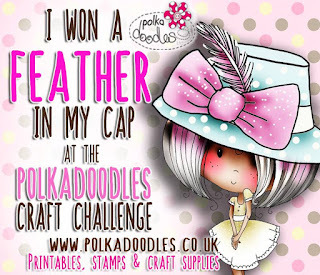 Remember if you use a Polkadoodles image you could win a Feather in your Cap, more details on this in the pages tab above. 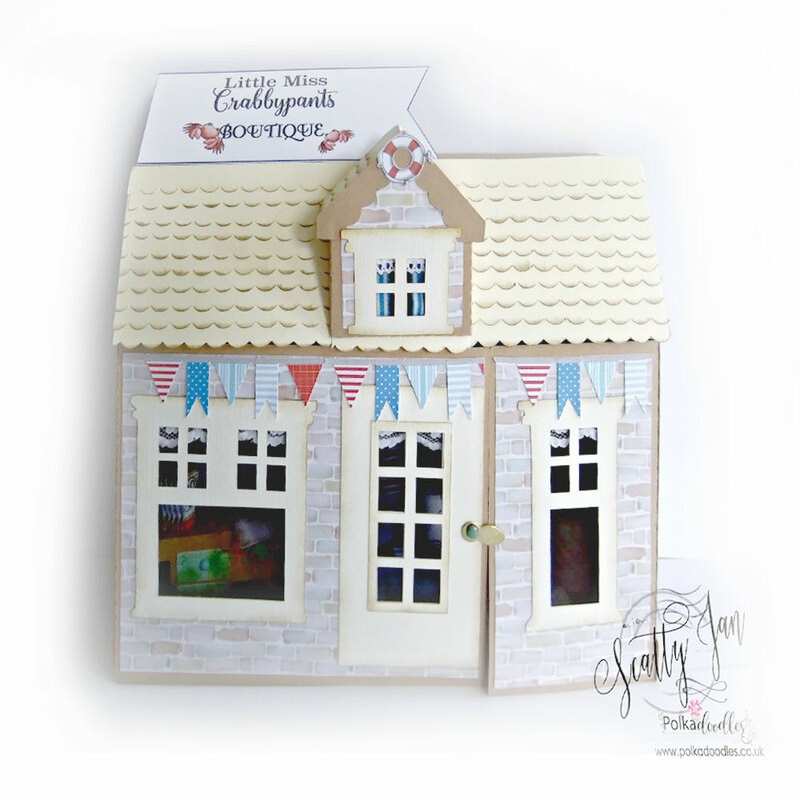 Anjie - I have made a door sign for our new summer house for this weeks challenge, using an MDF plaque. 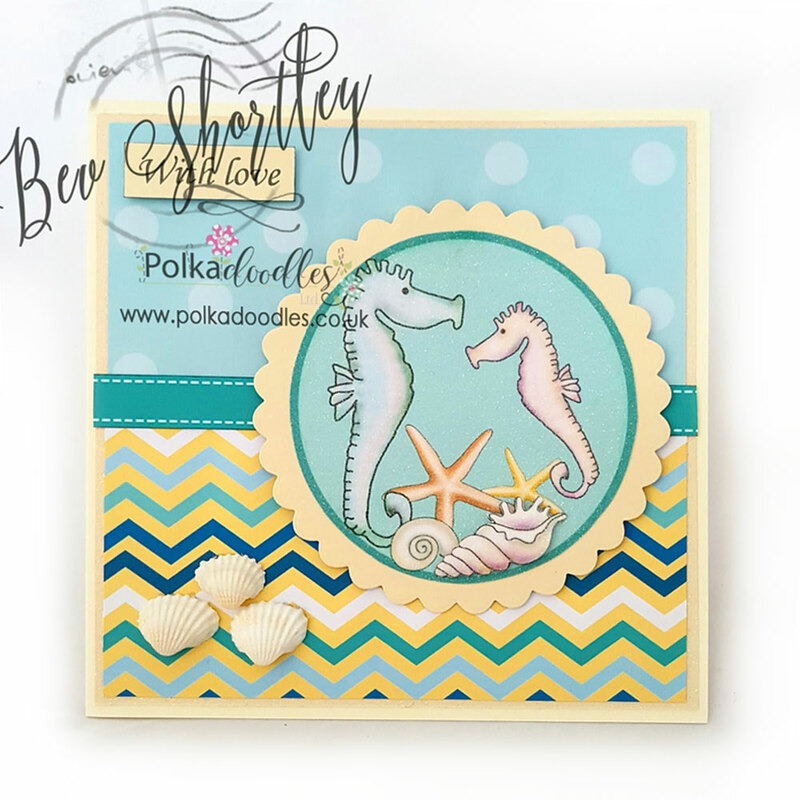 I used one of the plainer papers from the Winnie Starfish and Sandcastles collection as a back ground. 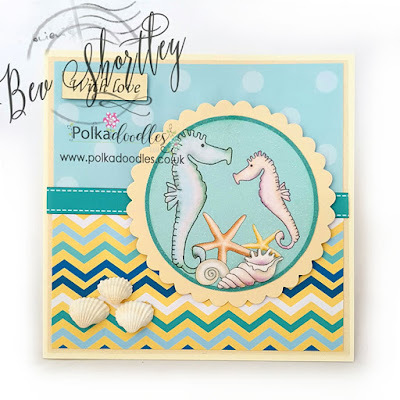 I then used the Tropical Oceans stamp set to stamp some background images onto the paper. 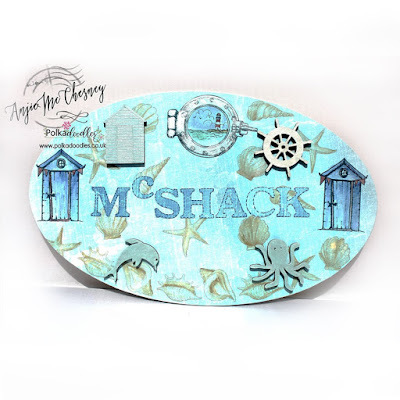 I then stamped the porthole and the beach hut. Finally I used a few of the MDF pieces from the Nautical large MDF embellies set Lots more info and photos on my blog. 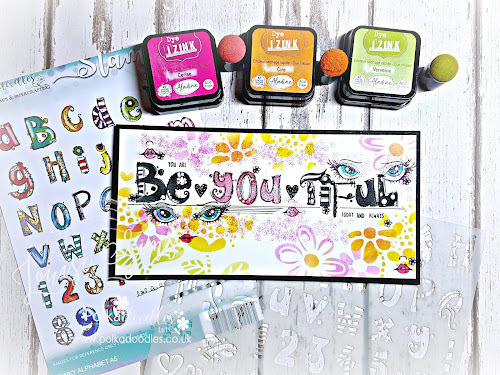 Tracy - So I have the perfect excuse to play with the wonderful Meribelle collection. I used the image called Swimming around. I had a chance to sit down, relax, music on and colour with copics and finished off with prisma pencils to make picture pop out. Bev here with my seaside creation for you using a pre coloured topper from the oh so useful Bonbon Belles. I run along the beach 3 times a week so used the colour scheme I see as my inspiration. 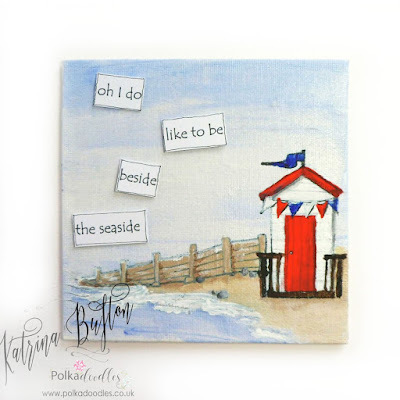 Katrina - I've made a little canvas using the beach hut digi stamp from the Summertime collection and the fence/shoreline digi from Winnie Starfish and Sandcastles. 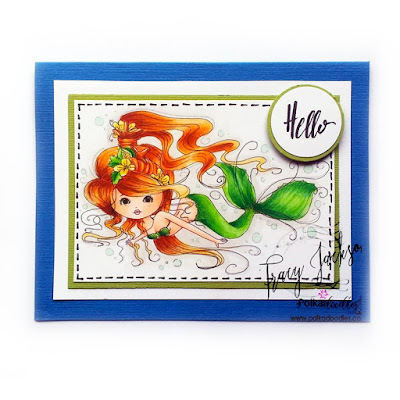 I resized and arranged them in Craft Artist before printing onto tissue paper. This was glued onto the canvas and I painted over the top with acrylics. Fabulous inspiration by the Design Team! Crafting time! Crafting time! The kids are back in school! Crafting time LOL! Before we start the challenge this week, just a heads up to set your alarms and reminders for next week's Create & Craft shows with Nikky - you can catch her on Fri 16th Sept at 2 & 7pm GMT so don't miss it! Closes: Noon, GMT, Friday 23rd Sept. 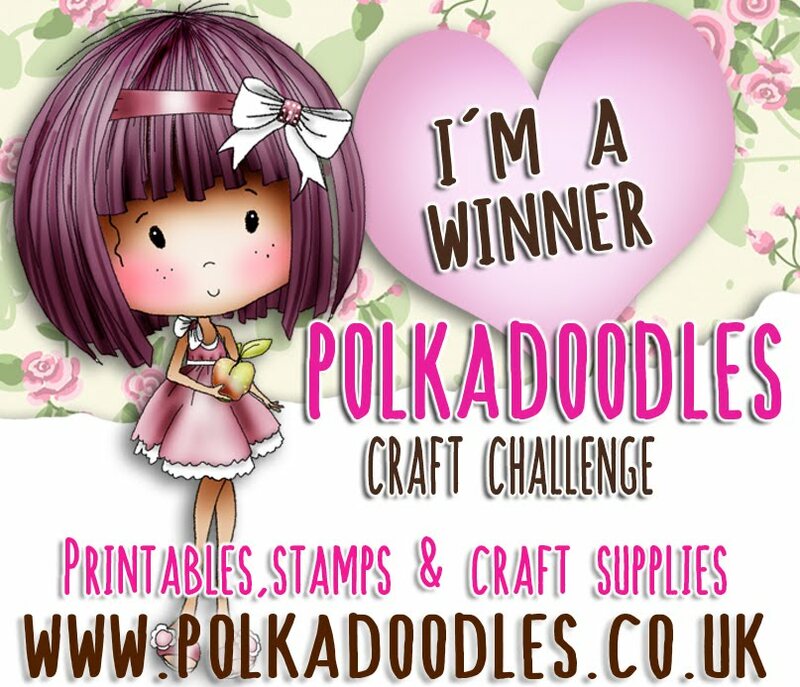 Winner: $10 voucher to the Polkadoodles Digital Download Store. 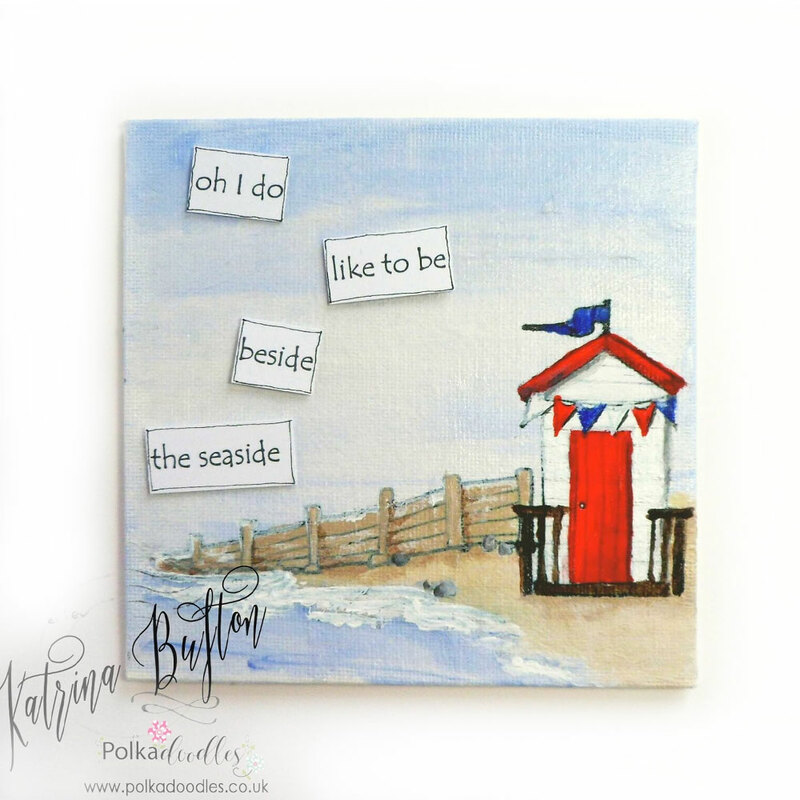 Now let's see what delights the Polkadoodles Design Team have for you this week - the DT's twist on the theme is Oh I Do Like To Be Beside The Seaside...if you want to join in with that theme then go for it! Helen - Oh I do like to be beside the seaside too, even when it's cold and windy as so often here in the UK. Our Winnie loves it too, sitting on the dock of the bay, dipping her toes and ooow look Merribelle Mermaid is taking a peep at her. 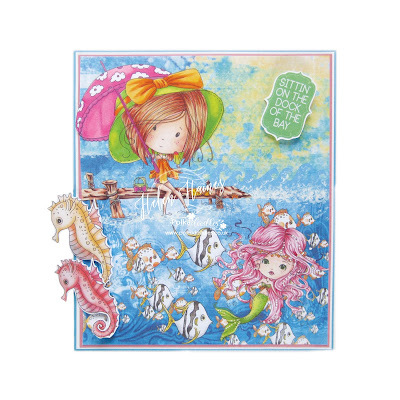 I have used two collections Starfish and Sandcastles, including Winnie and two backing papers merged together and lovely Meribelle Mermaid too. 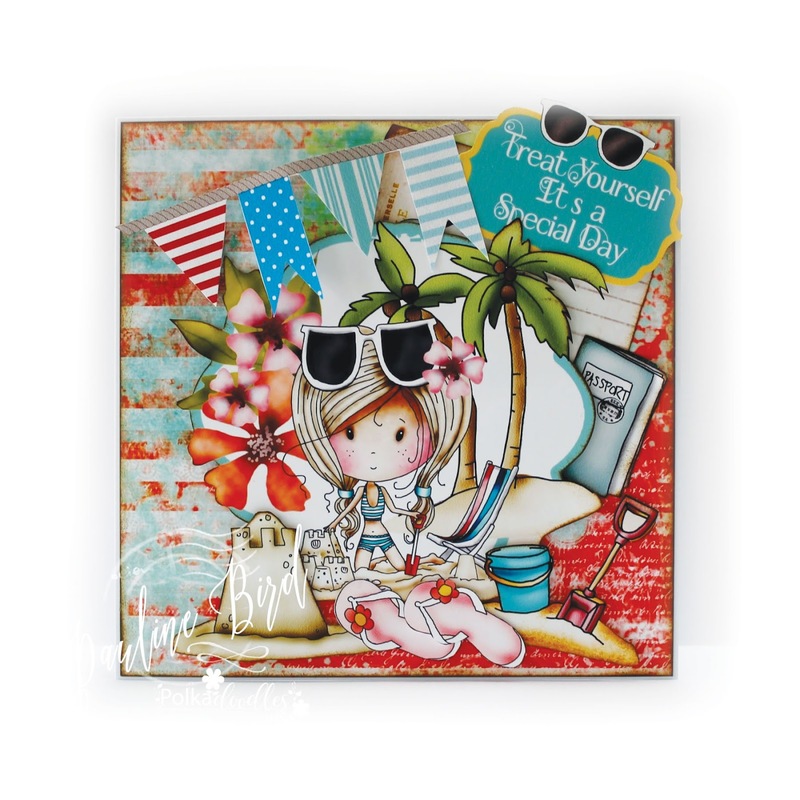 Carol - how fabulous is it to be by the seaside? For today's challenge inspiration I've used the very lovely Winnie Starfish and Sandcastles collection for my pre-coloured image, paper and embellishments. I added a sentiment from the collection on a sun shape I created using clip art. 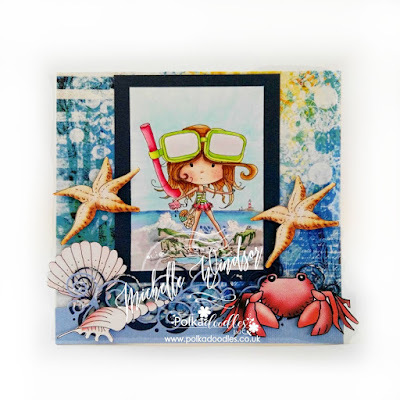 Pauline - I have used a super image from the the Winnie Starfish & Sandcastles CD collection, all of the gorgeous images on this CD are perfect for the Oh I do like to be beside the Seaside theme. 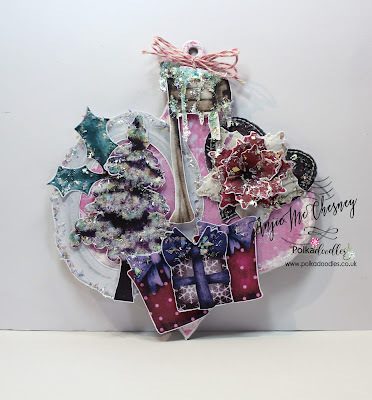 The papers, topper and elements are all from the CD, I have fussy cut lots of bits and pieces from a selection of the design sheets and from the embellies section. 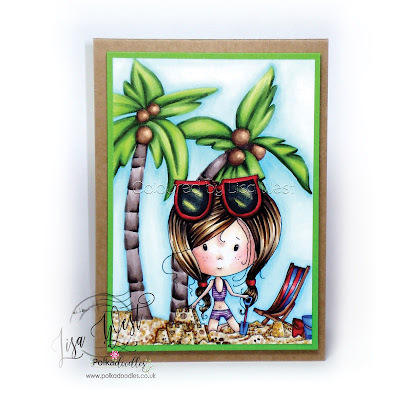 Lisa - I've used the wonderful Winnie Building Sandcastles digi stamp and merged it with the palm tree digi stamp that can be found on the Winnie Starfish & Sandcastles VIP XXL Download to create a scene. I have coloured the scene with alcohol markers and simply mat and layered onto some green card and a tent fold card blank. Karon - I have used several collections for my card today. Bonbon Belles Collection for the mermaid, beach huts, starfish, beach ball and all the papers. 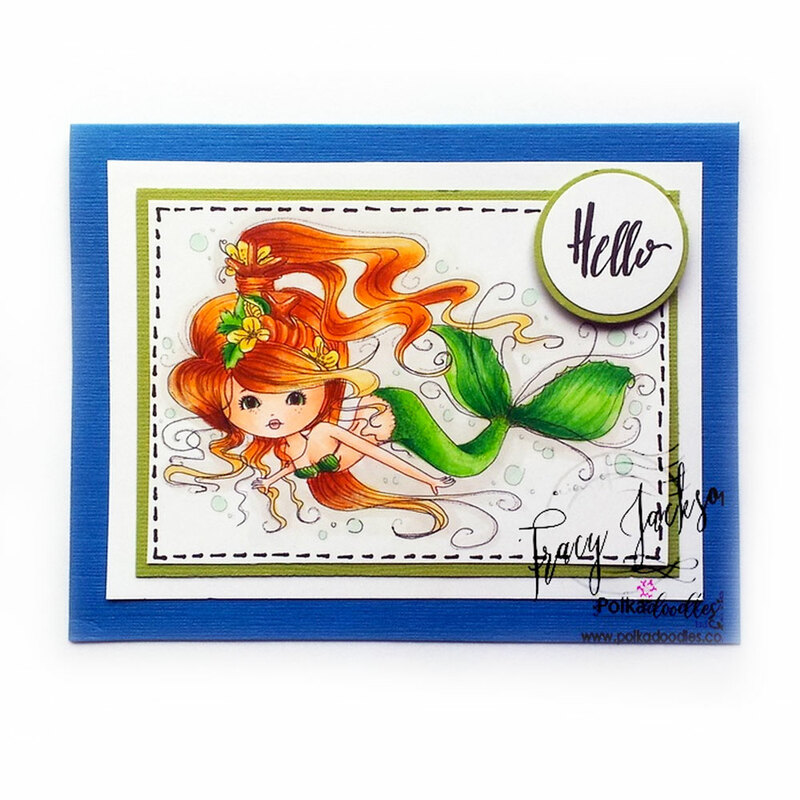 Then had to use the little girl swimmer from Work and Play 4 Collection. 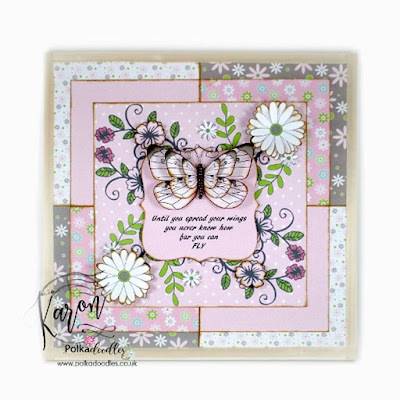 The sentiment comes form the Summertime Collection and the scene and fence is from the wonderful Cherryblossom Lane Collection. or the twist Beside the Seaside - it's up to you! You have until Noon, GMT, Friday 9th September to enter this challenge. We only have a few little rules to follow and they are over there in the side bar ----> You do not need to use Polkadoodles products to enter our challenges.Our winners of our Weeks 32/33 Anything Goes Challenge and our Feather in my Cap winners for using PD Images (more details at the top in the tabs section) will be at the end of this post. Helen - Anyone for chocolate? Of course, its always time for chocolate in my book and Winnie seems to agree with me, she's just about to tuck in to a great big bar. 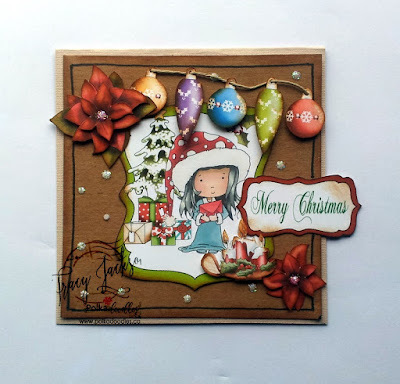 I've chosen to use Mmmmm Chocolate from the Sugar Sprinkles collection. I coloured her with Copics and used some embellies from the collection including the chocolate bar which I also put into My Craft Artist to mak a chocolatey backing paper. Lisa - I'm getting ahead with my Chrimbo cards for this year and I have used the Twiggy & Toots Festive Fun Download Collection. 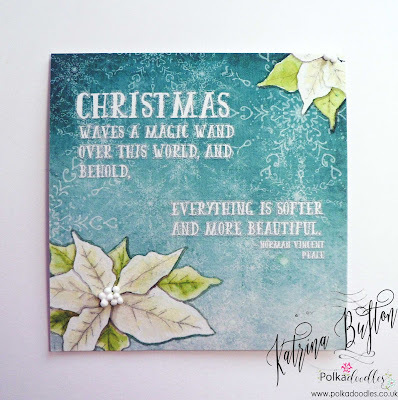 I faded 2 of the mistletoe digis to pale grey, placed them in opposite corners and merged with the the sentiment, before printing onto white linen card. This has been mat and layered with Kraft card and papers also from the download. Some twine, pearls and a little pine cone to decorate. 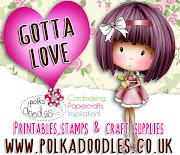 Carol - Love love love the gorgeous floral papers from the Winnie Wonderland Paper Heaven 6 download. 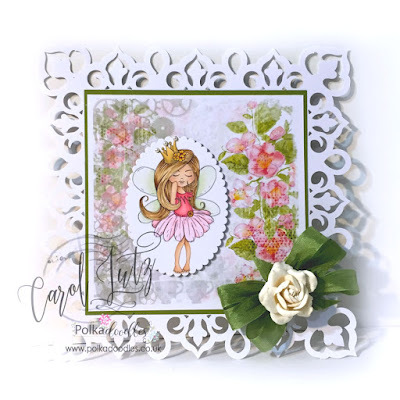 Here I've teamed them with one of my favourite Polkadoodles fairies - Serenity Princess. Adding a background layer created using an around the page punch, a triple bow and a white rose. So quick and easy! 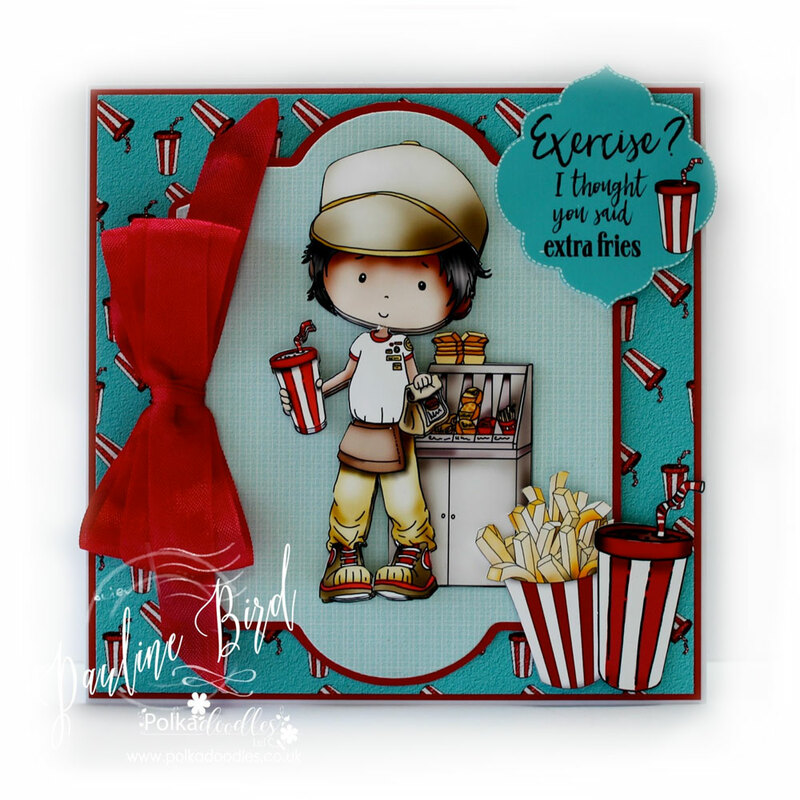 Pauline - I have used a super image from the the Work and Play 12 collection called 'Fast Food' along with some of the matching papers and a sentiment - I just love the sentiment! I printed him three times so that I could add some decoupage layers and also printed the fries and drink from the embellies section. Ruth: I've coloured the cute Footballer digi with Promarkers and then made a background of football pitches with some green card. The digis are so versatile and can be enlarged without image quality loss! Wow - fabulous and inspiring inspiration by the team this week.